Hey Guys! Sass here again. want to try your absolute hardest and get your name at the top of the board. of your gauntlet level for your kingdom or to go up a gauntlet level. till they have done their quest. you. All you will have to do is join. talents on gathering and max load, stick your neocros gear on and check your research has been done for gathering as this will help you. Even stick a boost on. resource ones, go for food tiles. They have the most amount in them! to send it back to you (boomerang resources). saint and some dam good hell event oh and a lot of alcohol to help your stress. how well your team does. In the expert gauntlet, You get quests that are called mystery quests. These ones will give you high points, but you don't know what your quest will be. Take a mystery quest for 210 points for example, you could get: gather 20mil resources or finish phase 3 hell event 10 times. It's pot luck what you could get. 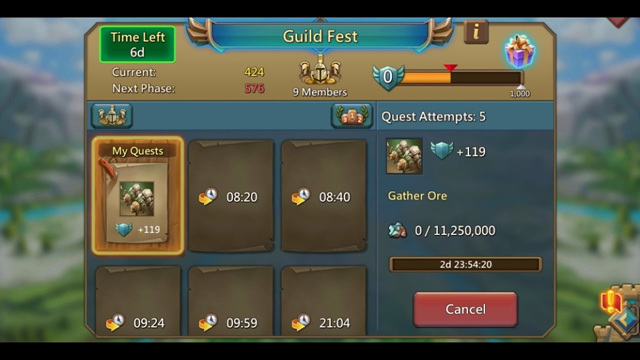 Another quest can be to gather 3 lvl.19 essence, which you need a whole rally of t4 to do. Other quests are execute leaders in a given amount of time. There's some pretty difficult quests that will be on the board but don't worry, working as a team, you will do them. then please help them. It might be their first time doing guild fest.